Videos, examples, solutions, and lessons to help Grade 4 students learn the relative sizes of measurement units within one system of units including km, m, cm; kg, g; lb, oz. ; l, ml; hr, min, sec. Within a single system of measurement, express measurements in a larger unit in terms of a smaller unit. Record measurement equivalents in a two-column table. I can describe the relative size of units (100 m are in a km, 100 cm are in a m, 16 ounces are in a pound). I can represent a larger unit with smaller units (36 m = 360 cm, 4 yards = 48 inches). 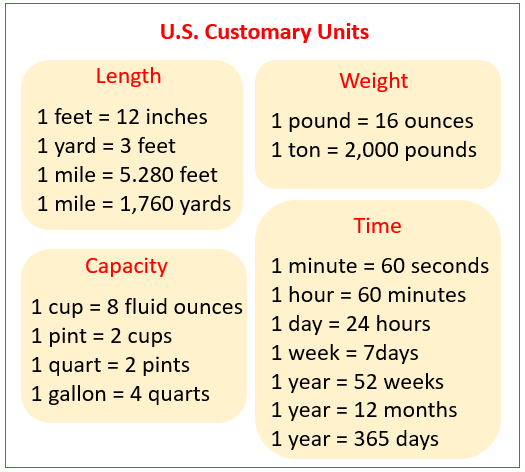 The following table gives the customary unit conversions for length, weight, capacity, and time. Scroll down the page for more examples and solutions. 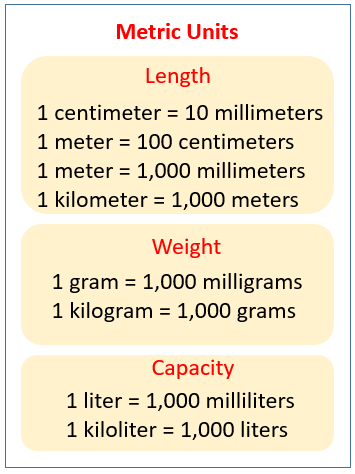 The following table gives the metric unit conversions for ength, weight, and capacity. Scroll down the page for more examples and solutions. In this lesson, you will learn how to record measurement equivalents in a two-column table. Feet and inches, pounds and ounces, minutes and seconds, feet and yards. Meters and centimeters, grams and kilograms, liters and milliliters.